Continuing that salty-savory theme from yesterday, Darcie and I have a flavorful, simple dish to finish up Small Bites Week here at the Advent Calendar. Mixed-olive tapenade is easy to whip up the day before a big party (in fact, it’s better if you do!) 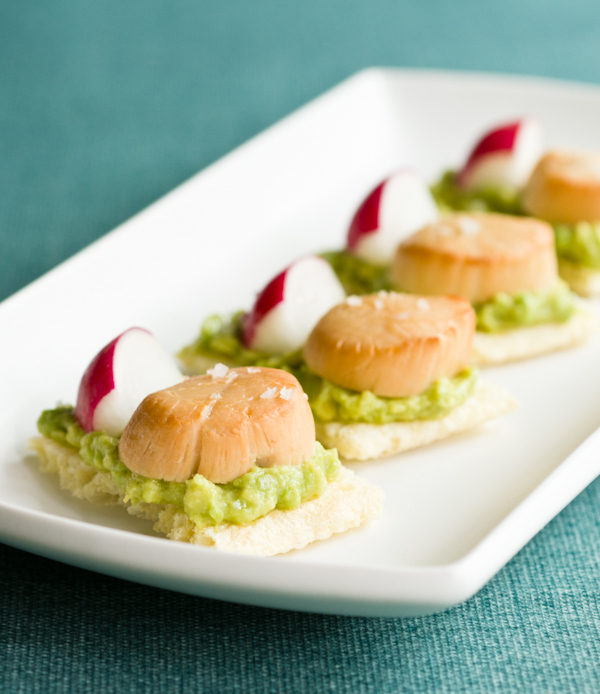 and you can throw the assembled appetizers together in a flash. Tapenade can be mouth-puckeringly salty, which is fine in certain applications, but here you want something a bit mellower, so I take a two-pronged approach. Starting with the olives themselves, I err on the side of less salty, fruity varieties, like juicy Castelvetrano or Cerignola olives, both of which I always find at Fairway Market‘s amazing olive bar. If I’m using something a bit brinier, I’ll rinse and dry them before proceeding. And then, it’s really nice to add some nuts to the mix — just be sure they’re raw, or you’ll be defeating the purpose. I toast them lightly for flavor and find they really mellow out the tapenade and add a nice, smooth flavor, especially if you prepare this a day in advance. You can serve this on crackers, but I encourage you to try the grilled Japanese eggplant rounds. 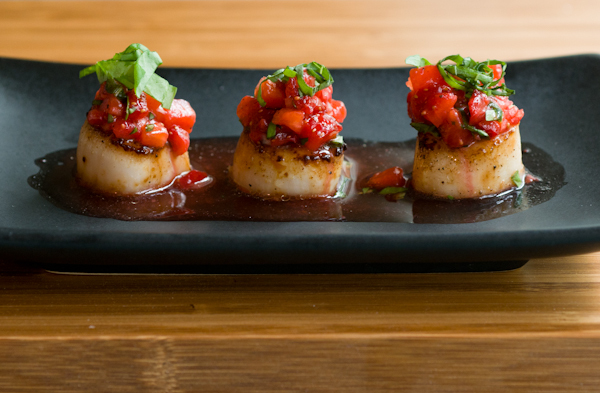 They really complement the tapenade and turn it into a whole appetizer, rather than just a spread. Let us know what you think if you try it! If the olives you’re using are especially salty, rinse and dry them before proceeding. I like a hefty proportion of green olives in this mix, and used a combination of Castelvetrano and Liguria for this preparation. Brush cut sides of eggplant with a little olive oil. Grill on outdoor grill at medium heat or in a grill pan on a burner set to medium-high heat until cooked through. Place all tapenade ingredients in the bowl of a food processor and pulse in one-second increments until blended. Process less for a chunkier texture and more for a creamier one. Add a little extra olive oil if you prefer it thinner. To serve, spoon a tiny scoop of tapenade onto a grilled eggplant round and top with a piece of shaved grana padano, if desired. Kasha and I are back with more Field to Feast posts this week! Head over to The FarmGirl Cooks for more ideas on what to do with what’s in season. So that’s why this post is so slim. My nasal passages apologize for the interruption, but promise that next week’s post will be a doozy, so be sure to tune in. My busy schedule of TV marathons and napping notwithstanding, I DID manage to work up a new spinach recipe this week. I wanted to make gluten-free spanakopita for you, but let’s get real. There’s NO WAY I’d attempt to make my own phyllo dough (gf or otherwise), so I thought spinach turnovers would be an acceptable substitute. And they were entirely delicious, if not the same texture as flaky spanakopita. For the pastry, I used the pie crust recipe at Cup4Cup minus the sugar, then adapted the filling from Vegetarian Times. I rolled out the dough to about 1/8″ thickness, then cut out individual turnovers with a 4″ round cutter, which made a nicely-sized turnover to be eaten in a few bites. You could size these up or down without too much of a problem, as long as you adjusted the amount of filling in each. Believe me, what looks like a paltry amount of filling can become a big mess when folding and crimping if you’re not careful. Just a word of warning. 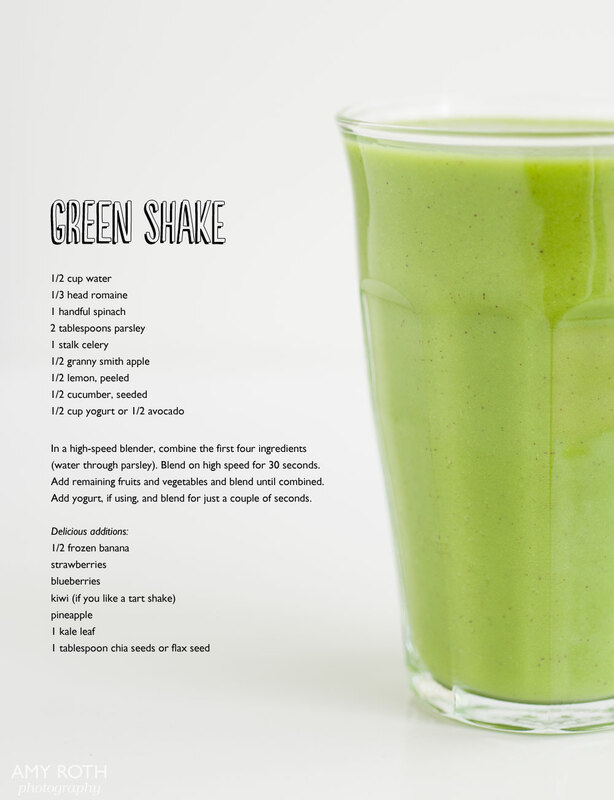 And since everyone (me included) seems to be on a green shake kick lately, I’ve included the one I make for myself nearly every morning. It’s a good baseline to use and produces a very pretty shake. You can always add other fruits or vegetables to it. Just know that strawberries and blueberries, while delicious additions, mean you’ll be drinking a shake the color of a bruise. As long as visuals aren’t that important to you, carry on! This post brought to you by Cefuroxime Axetil, Nasonex and DayQuil. Recipes below, if you want to copy and paste text instead of referring to an image. Rinse and drain spinach and, with water still clinging to leaves, transfer to large skillet. Cover, and cook over medium-high heat until wilted. 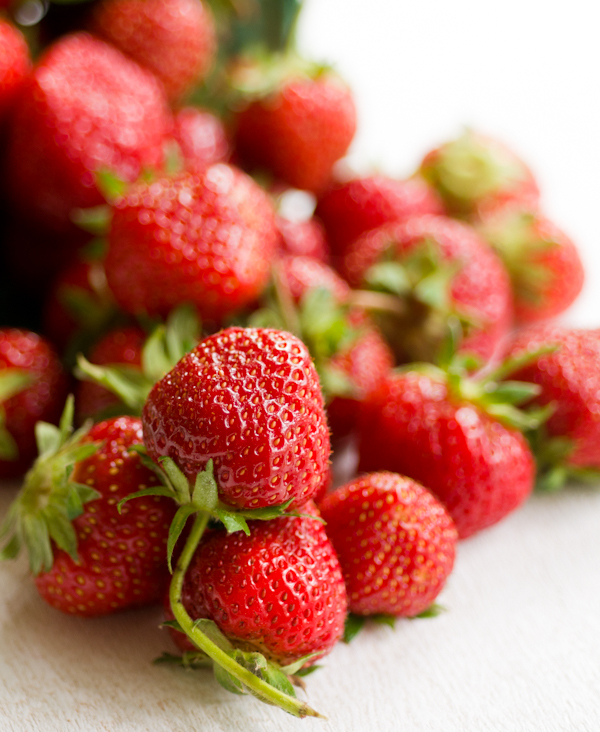 Rinse with cold water in a colander, squeeze out liquid, and coarsely chop. Heat garlic confit (or garlic and olive oil) in a large skillet over medium-low heat. When it starts to sizzle, add onion and cook until softened. Add spinach; cook 2 minutes more. Transfer to bowl and cool. Stir ricotta and feta cheeses into spinach mixture. Adjust seasoning, if necessary. Preheat oven to 350˚F, and line a baking sheet with parchment paper. Roll dough to 1/8″ thickness and, using a 4″ round biscuit cutter, cut out as many circles as you can. Remove extra dough and place back in bowl. 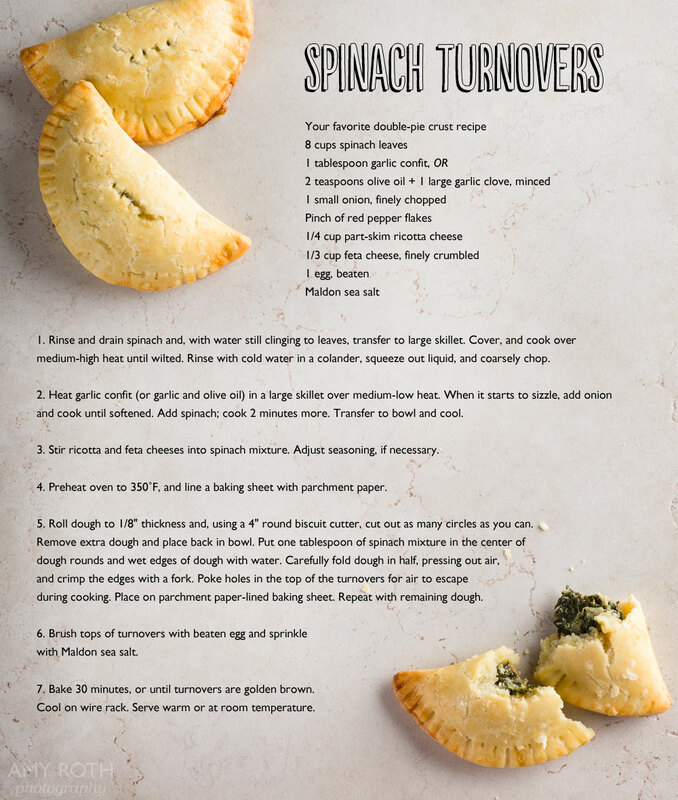 Put one tablespoon of spinach mixture in the center of dough rounds and wet edges of dough with water. Carefully fold dough in half, pressing out air, and crimp the edges with a fork. Poke holes in the top of the turnovers for air to escape during cooking. Place on parchment paper-lined baking sheet. Repeat with remaining dough. Brush tops of turnovers with beaten egg and sprinkle with Maldon sea salt. Bake 30 minutes, or until turnovers are golden brown. Cool on wire rack. Serve warm or at room temperature. In a high-speed blender, combine the first four ingredients(water through parsley). Blend on high speed for 30 seconds. Add remaining fruits and vegetables and blend until combined. Add yogurt, if using, and blend for just a couple of seconds. I realized there were a lot of half-finished posts in my folder that didn’t quite meet the mark individually, but worked together as a summertime pot luck, so that’s what you get today. Hope you don’t mind leftovers! To blame my recent lack of cooking and posting on the lazy, hazy days of summer wouldn’t be entirely wrong, but wouldn’t be the whole story, either. Now that I don’t have those killer workdays anymore, I find myself wanting to take it a little easier. We wake up at 6:30am now instead of 5, which is a lovely thing. After walking the dogs, I have a strenuous-for-me yoga workout, then start my day after Gil goes to work. Our house is the cleanest it’s ever been — not as easy as it sounds with perpetual shedding machines underfoot — plus I’ve gotten my portfolio and billing system in order. (There are a few projects on the horizon, but no contracts in hand yet, so I’m taking advantage of this down time while it lasts.) You’d think I’d want to spend at least part of my day making a big production in the kitchen, but that just hasn’t been the case. While we’re swimming in beautiful, local produce, going overboard isn’t necessary at all. Grilling’s another story since it doesn’t heat up the house and takes so little time to accomplish great things. For the bastardized bi bim bap above, I salted and grilled a nice grass-fed steak for about three minutes per side then brushed it with a mixture of equal parts miso, Dijon mustard and melted butter* and cooked it for an additional minute on each side. After the steak rested for a few minutes, I sliced it up and served it over rice with some vegetables I had in the fridge — carrots, asparagus, and shredded spinach and arugula — and thinned out a little of my homemade gochujang with water to make a simple dressing. An over-easy egg would not be a bad idea on top, but this was more than enough food for me. * Since I first read about the miso-mustard-butter blend on the always-excellent Cookblog, I’ve been obsessed. We went through a stretch of eating it a few times a week as I experimented. I can report that it’s gorgeous with salt-roasted root vegetables and welcomes maple syrup with open arms. A few days later, our friend Mark paid a visit. I love having him over, not just because of the great conversation and incredible stories (check out the Virtual Memories podcast he recorded with my husband), but also because he really knows how to make a cook feel appreciated. Planning a menu is a lot of fun when you know someone will get a kick out of it. The main course was smoked chicken, so I started us off with a simple appetizer to eat while the chicken was cooking low and slow. It took advantage of the massive amount of beautiful English peas we had in the market at the time. I wanted the flavor of the peas to shine through, so after shelling and blanching them, I kept the rest of the preparation minimal. Peas, sweet onion, avocado, a little fresh garlic and lemon juice. I whirred it to taste in a food processor with some salt and fresh thyme, and had a silky dip perfect for crudités or spreading on toast or crackers. Local produce from Bialas Farms. Grass-fed steak from Snoep Winkel Farm. Ricotta from Edgwick Farm. Yes, it’s cold and snowy out there and I already only want to eat meat until spring, but I also work in New York, where it’s impossible to spend any time at all without having meatballs thrust upon you. (Er, “without encountering meatballs”? “Without reading about them” or “passing a restaurant that has them on the menu”?) Just off the top of my head, there’s The Meatball Shop, a recent meatball feature in The New York Times, Eataly‘s braised brisket meatballs (Woe is me, they’re across the street from my office!) and Deb at Smitten Kitchen happened to run a beautiful post a few weeks ago about Canal House Cooking ‘s Scallion Meatballs. So who can blame me for having balls of meat on the brain? Please ignore the Eddie Murphy welfare burger appearance of this meatball. I decided to add a pomegranate glaze just because I wanted a bright contrast to the earthiness of the lamb. It worked so well, it’ll become a permanent part of the rotation, I believe. If it’s not too frou-frou, maybe I’ll even make it for a Super Bowl appetizer (though it won’t go well with the inevitable cheese dip). But it was a late lunch for us today, so I served it with apricot and caramelized onion brown rice to make a meal of it. The rice was superfluous; we could’ve made an entire meal of the meatballs and lived happily to tell the tale. We went straight from winter to summer around here, and not a moment too soon. I’m stuck in an office today instead of out enjoying perfect grilling/hanging out/whatever weather, but at least it gives me time to reflect on last weekend’s fixin’s. We’re going to have some green on this blog and lots of it now that our local farmers’ market is back for the season! It was a bittersweet opening, as some of you know — our market is now dog-free. Poor Gil looked like a lost soul just wandering around without the boys, while I did what I always do and loaded up on good stuff to carry home. We’ll probably venture out to other markets that are dog-friendly in upcoming weeks, so stay tuned for a full report. I felt like an appetizer to get the ball rolling, and ended up with one that would be just as good for barbecues as for a light dinner during grilling season — grilled potato rounds with radish-green pesto and shaved asparagus. It’s vegetarian, nutrient-dense and good hot or cold (though I give the nod to hot-off-the-grill because crispy grilled potatoes just can’t be beat). It’s easily adapted to use what you have in the house. The radish-green pesto came about because I hate throwing anything away, and a pesto is just about the easiest way to use extra greens. If you don’t have radish greens or just don’t like them, use any kind of pesto you prefer. I had some garlic confit in the fridge, so I tossed the asparagus with garlic oil and lemon juice, but go ahead and use olive oil if that’s what you have. For lunch, I rejiggered my triple-garlic pizza, adding quick-pickled wild garlic & spring onions and shaved asparagus and radish-green pesto leftovers. Really good stuff. These quick-pickled wild garlic & spring onions were inspired by Smitten Kitchen’s pickled onions. A thin layer of mozzarella and grated parmesan and garlic confit (natch) tied the whole pizza together. We made short work of it, I’m afraid, but I still have the makings for one more pie, which should be just the thing to kick off this next weekend. Mirliton’s kind of sneaky. Your odds of finding it by that name outside of Louisiana are about as good as a collection agency making a successful phone call: “You’re looking for Mirliton? Yeah, sorry, he just stepped out. … Who, me? I’m, uuuhhh, Chayote. Oh, and Mango Squash is around, too, if you’d like to talk to her.” If you can’t tell, it goes by any number of aliases, so finding them in your neck of the woods shouldn’t be especially difficult. Like a summer squash, it’s not exactly assertive on the flavor front, but does a great job absorbing seasonings from its dish-mates. My grandma used to make a wonderful mirliton bread (similar to zucchini bread) and a mirliton casserole with fresh shrimp and crabmeat that would be pretty familiar to most people of the Cajun persuasion. I may have to recreate that casserole soon, but first I had to attempt the pickles my cousin Darrin made last Christmas. Slightly sweet, spicy and just crispy enough to provide some resistance… well, I just had an envie, cher. Luckily, chayotes were abundant at my grocery, so I picked up what felt like 10 pounds to my pipe cleaner arms for the recipe I’d chosen from Chef John Folse’s site. I knew these pickles would really cure any homesickness I was feeling thanks to the Zatarain’s bath and copious amounts of garlic that were featured. Seriously, these things are paradoxically slippery and sticky once you cut into them, so you’ll dearly regret it if you don’t invest in a cheap pair of gloves. They’re not especially hard to slice or to peel, but I’m a big proponent of sharp knives and it made for a better picture. They really resemble mutant, juicy apples, at least in cross-section. I didn’t bother canning them proper-like because I was sure that: 1) Refrigeration, plus the vinegar in the brine would keep them from spoiling, and 2) They wouldn’t be around for very long, anyway. And I’m very happy to report that success was achieved. No picture of the finished product because they’re pickles, ya know? But they really set off a spicy Bloody Mary, and anyone I’ve shared them with has raved. Could be mere politeness, but I prefer to think Chef Folse hit another one out of the park. You know, they also resemble shriveled centenarian mouths.